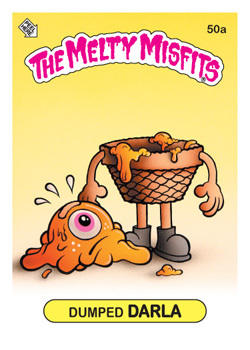 Without a doubt…the most insane parody item to come along is the MELTY MISFITS. 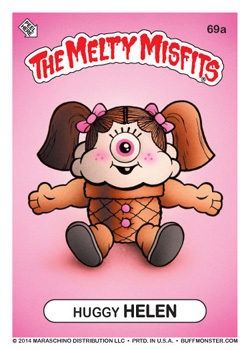 There are so many things that set this collectible apart from other bootleg/parody items: from the acute attention to detail, to the inclusion of gpk-esque errors, to the fun additional items (binder, poster, etc. ), this set has it all! This set is the brainchild of Buff Monster, an unabashed Garbage Pail Kids fan (with a fairly ridiculous GPK collection himself!). His love of GPK, and his effort to honor the art and history created by John Pound and Topps 30+ years ago, definitely shine through in this set. 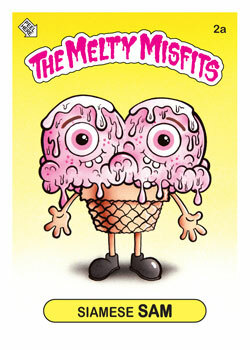 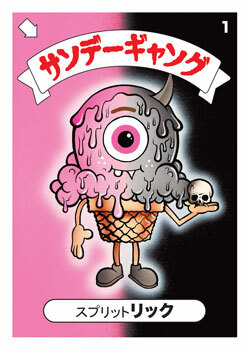 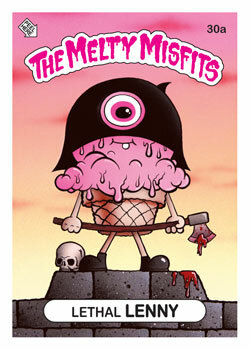 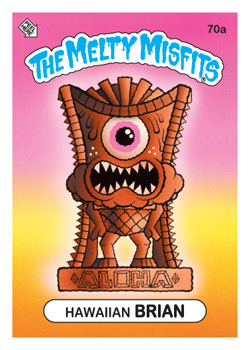 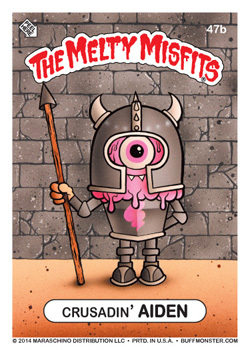 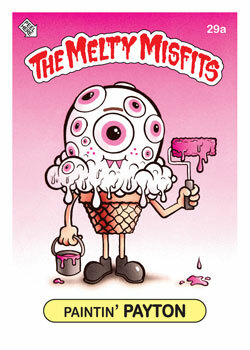 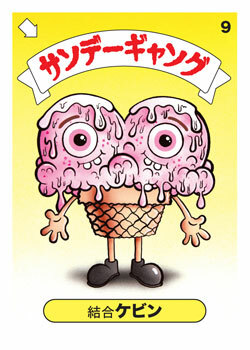 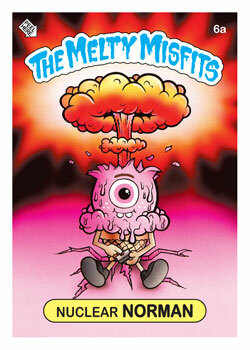 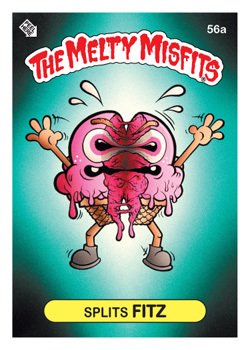 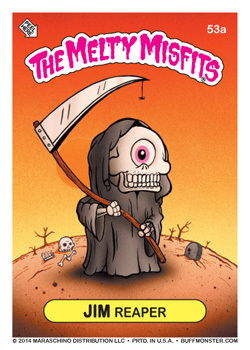 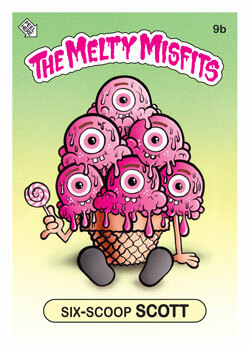 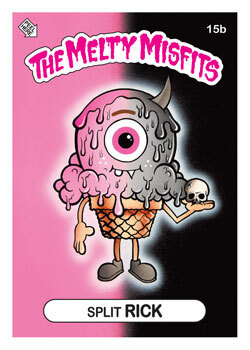 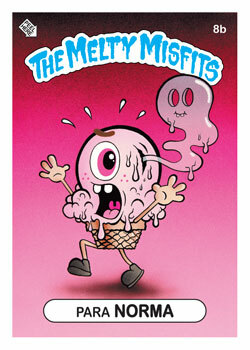 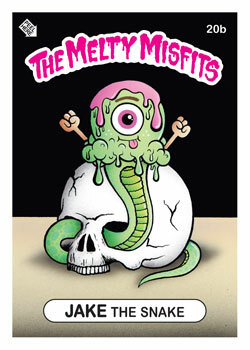 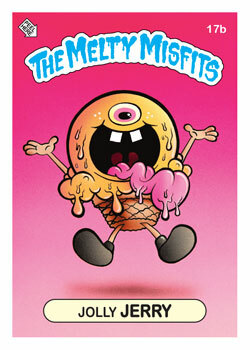 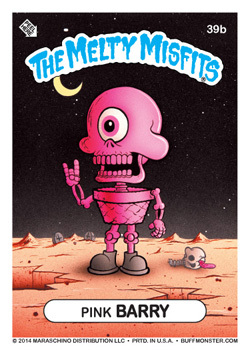 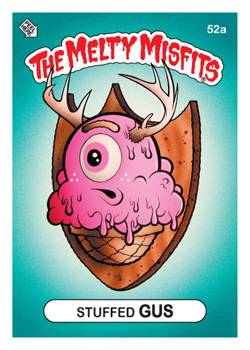 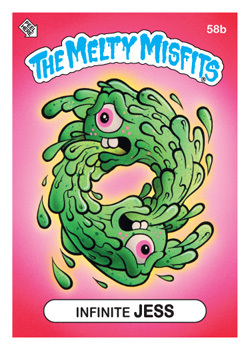 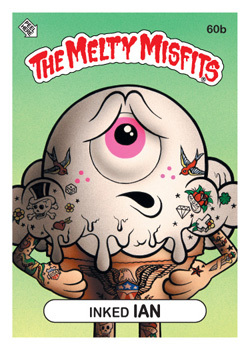 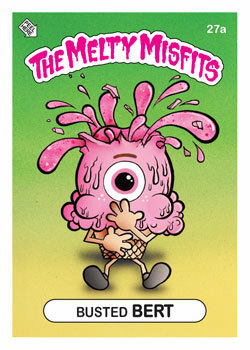 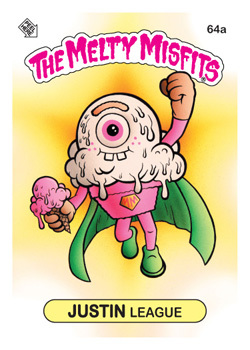 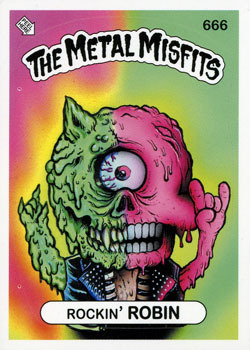 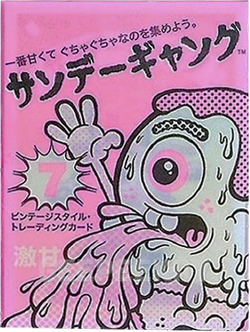 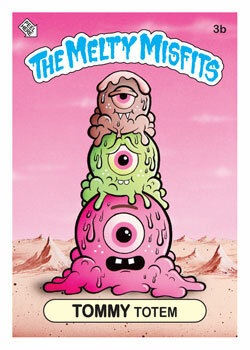 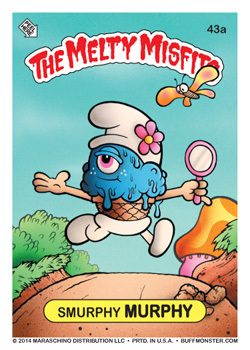 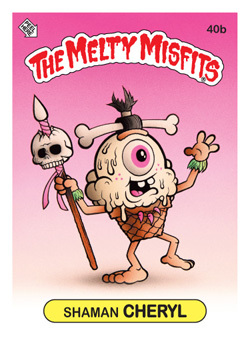 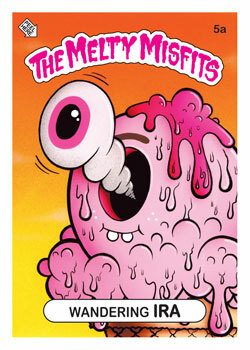 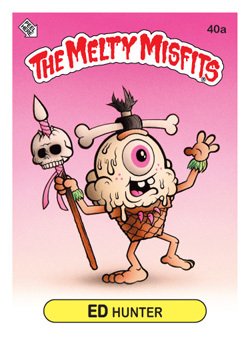 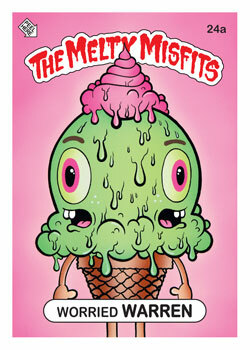 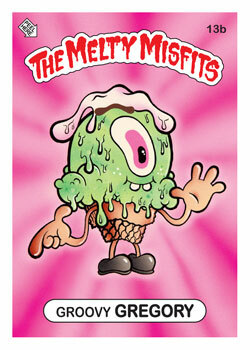 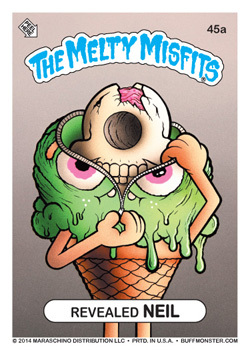 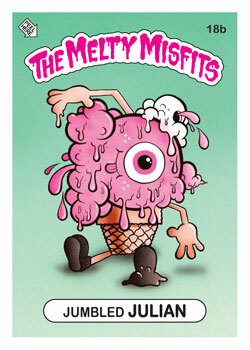 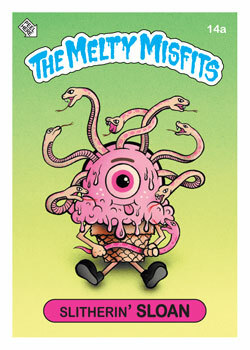 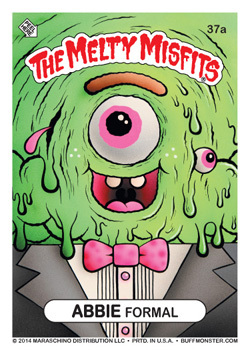 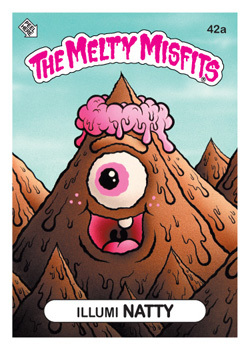 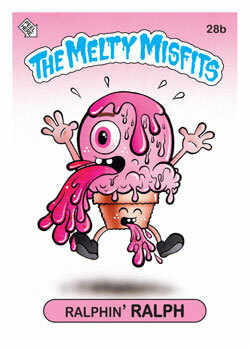 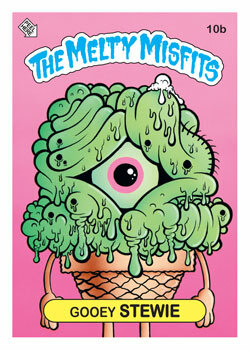 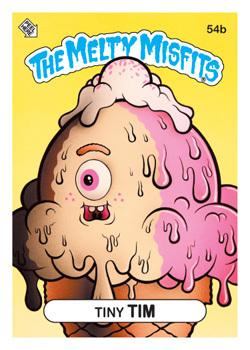 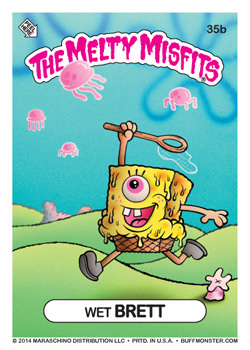 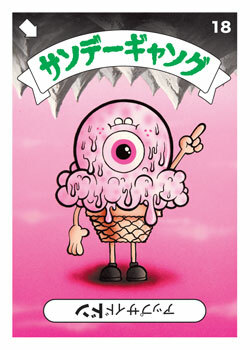 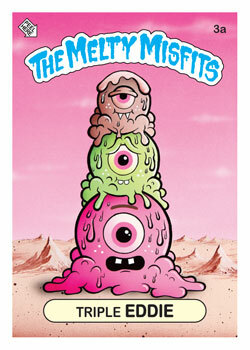 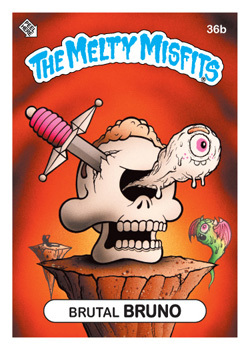 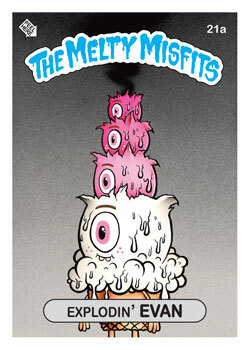 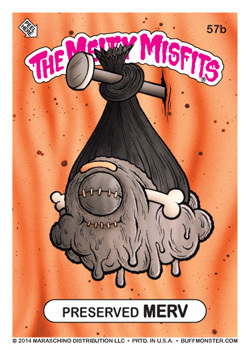 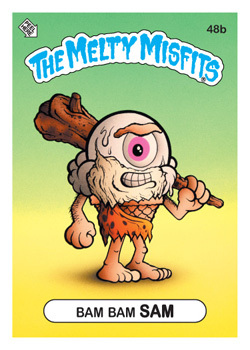 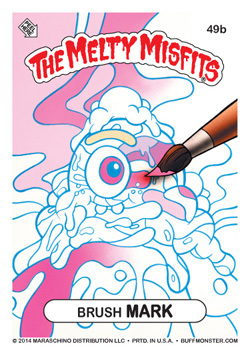 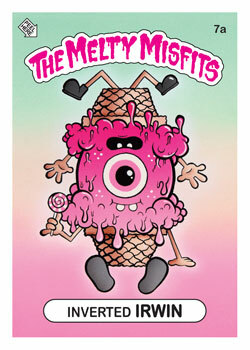 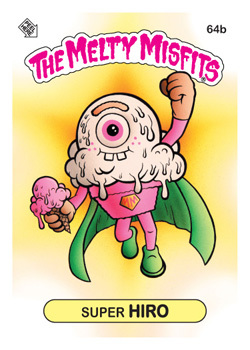 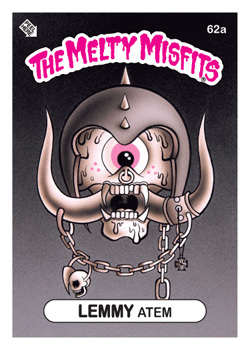 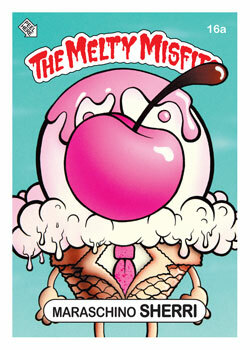 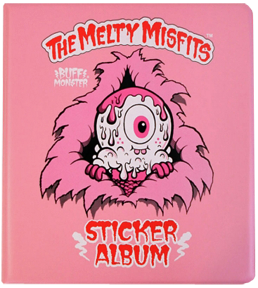 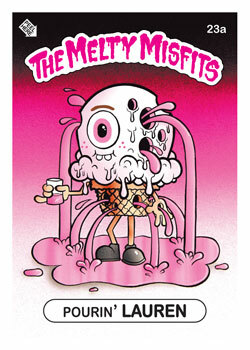 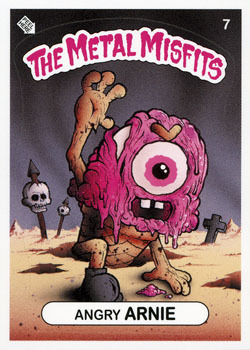 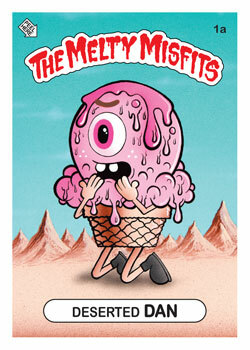 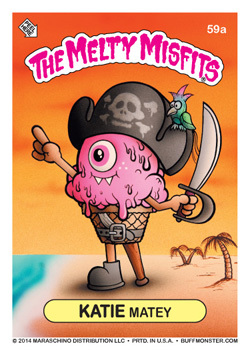 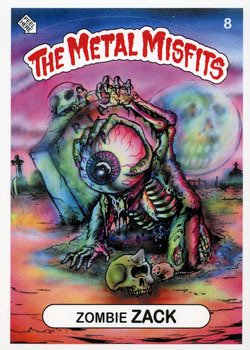 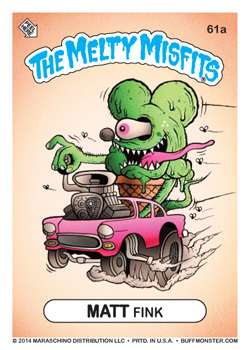 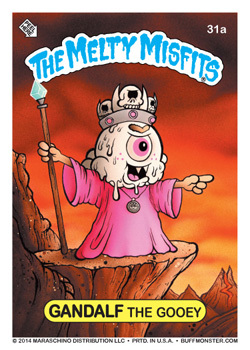 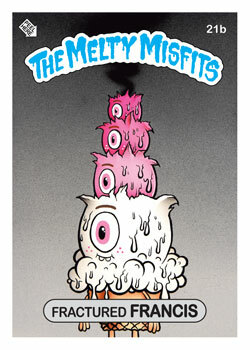 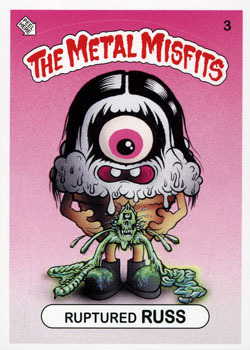 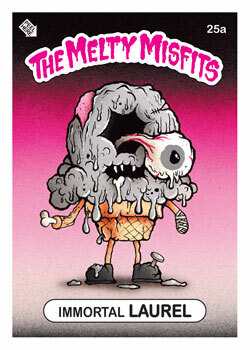 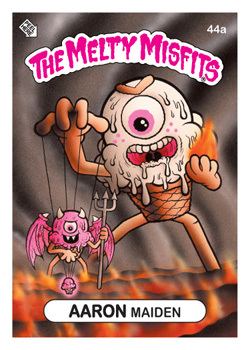 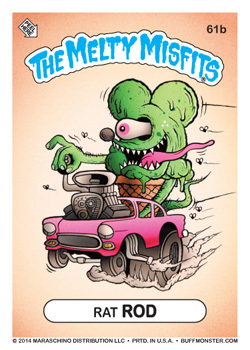 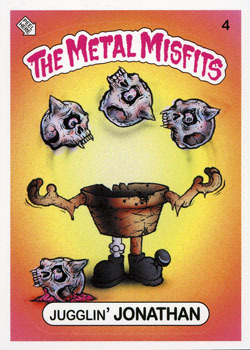 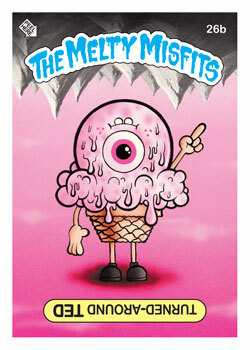 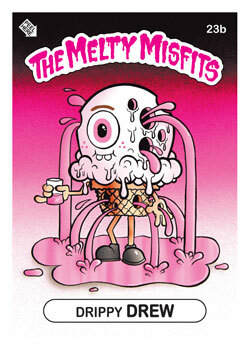 The Melty Misfits ™ is a set of trading cards created by artist Buff Monster and produced by Sidekick Labs. 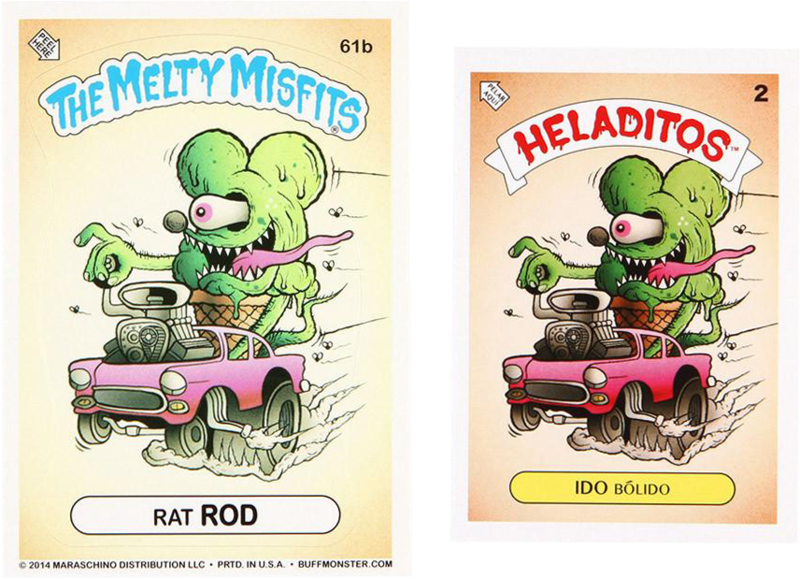 With an incredible eye for detail, we’ve gone to great lengths to create the highest quality homage to Garbage Pail Kids possible. 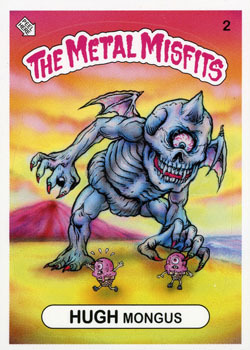 Each of the original paintings used for the cards was painted 5x7” using acrylic and airbrush, just like the original GPK paintings were done. 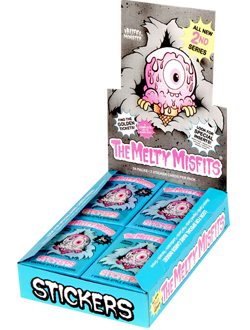 The cards are offset printed using custom-mixed inks on custom-made sticker stock, kiss-cut and packaged in a vintage-style wax wrapper. 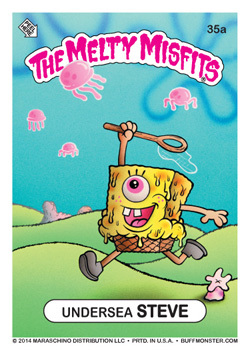 The backs of the cards feature puzzles, checklists and reproductions of the pencil sketches used to paint the cards. 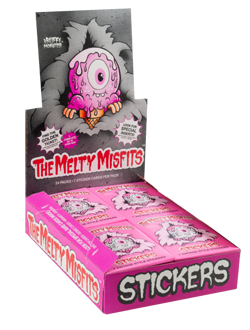 Each unopened box contains a complete set, along with special inserts such as signed cards, variants, errors and a poster. 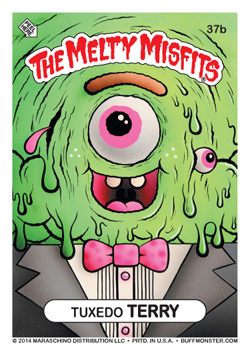 Some boxes have original sketch cards, and one box will have the Golden Ticket (redeemable for an original painting by Buff Monster- the first painting completed for the this series, but never used on a card). 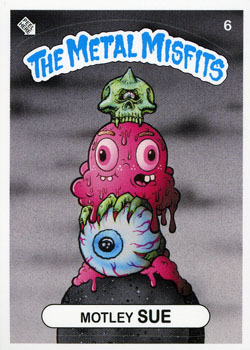 There's a lot to see...so get to it!! 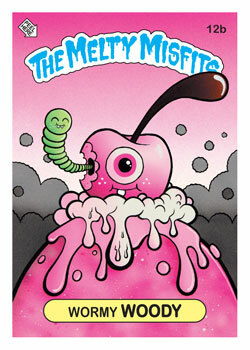 Buff Monster has produced a number of different series and subsets for Melty Misfits. 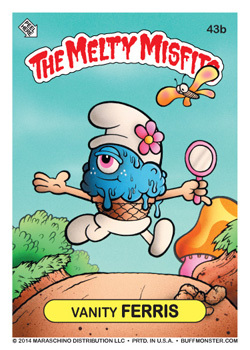 Below are gallery sections dedicated to each release. 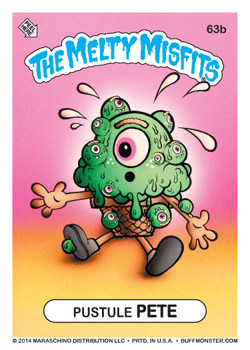 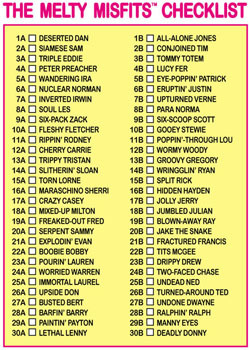 Released in April of 2012, this 60 sticker set (80 with variations) caused quite a stir in the Garbage Pail Kids community! 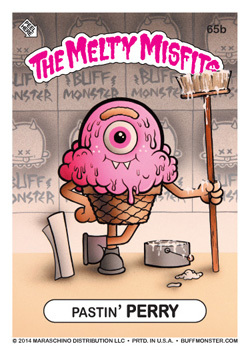 For Series 2 Buff Monster took to KickStarter and launched a campaign loaded with tons of add-ons and goodies for people who backed the project. 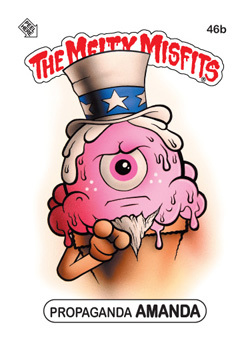 The campaign blew away it's goal within a number of days and the rest is history! 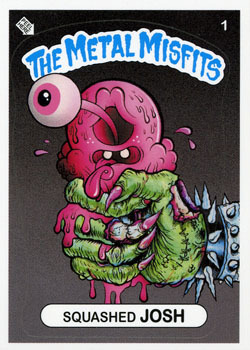 Foil cards, 3D cards, autographs, sketches, and more...they were all part of Series 2! 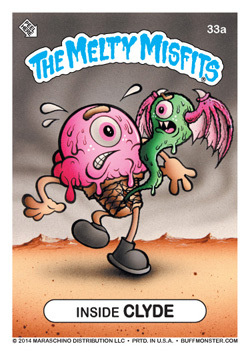 Released in October of 2012, this series differentiates itself from the regular series releases by abandoning the 'sticker' concept and replacing it with cardboard cards. 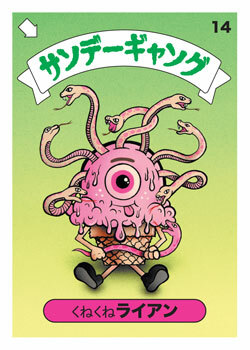 The trimmed-down set of 20 characters also has a very unique card-back…cleverly tying into the Japanese Bukimi Kun release of Garbage Pail Kids. 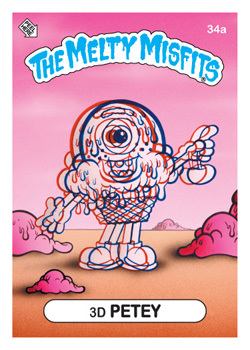 To no one's surprise, the attention-to-detail with this release is unbelievable - making this series extremely sought-after amongst collectors. 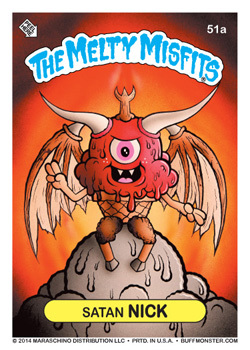 This condensed series of eight stickers (nine including the promo card #666) released in April of 2013 combines the wicked talents of both Buff Monster and L'amour Supreme, creating a truly memorable and jaw-dropingly-awesome set of stickers! 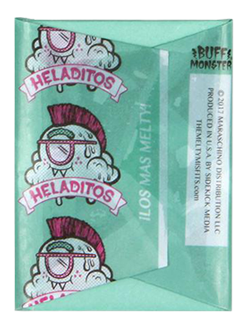 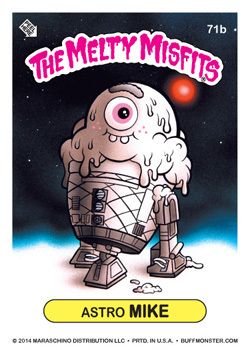 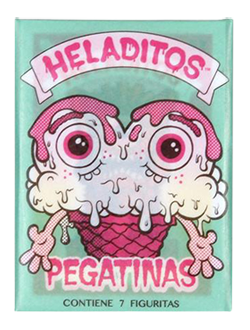 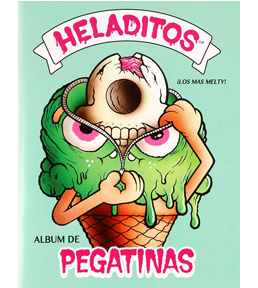 The Heladitos (“Little Ice Creams”) feature the same artwork from series 1 and 2 of The Melty Misfits, but they are presented in an entirely new way (much like the “Basuritas” from Argentina). They’re smaller than previous releases (2.125 x 3”) and they are not kiss cut. 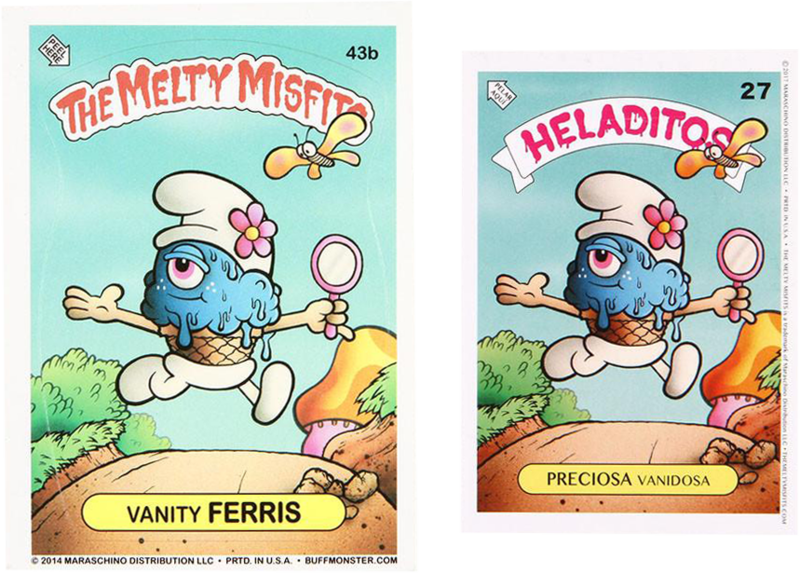 Below is a few images showing both the Promo cards available for the release, and also some sample images showing the size difference between a standard Melty Misfit sticker and a Heladitos card! The counter-display boxes for the MM releases are wonderful replicas of the popular Topps Non-Sport card-lines of the 80s. 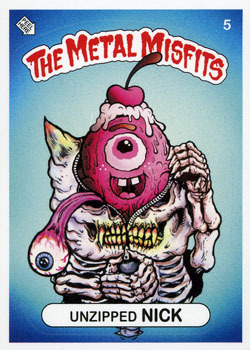 Perhaps one of the coolest Imperial Toys collectibles from the 80s was the Sticker Album - and not to be outdone, Buff Monster released unique binders for both Series 1 and Series 2! 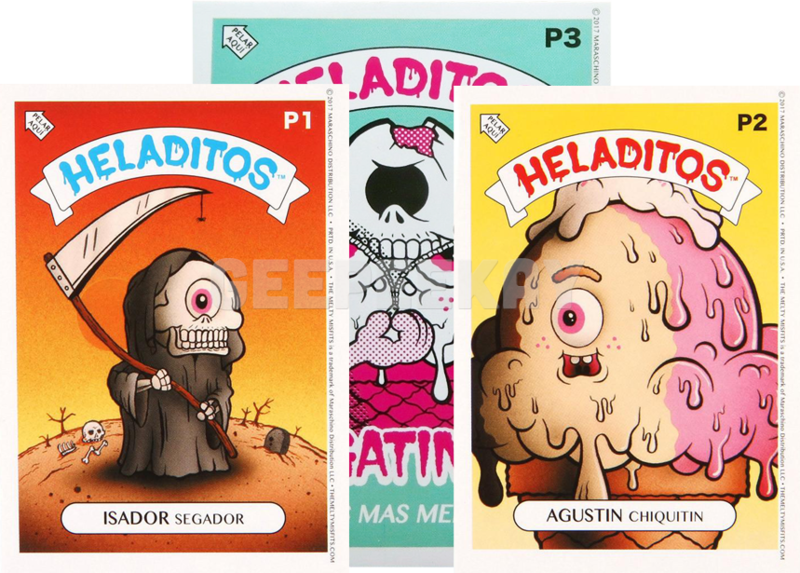 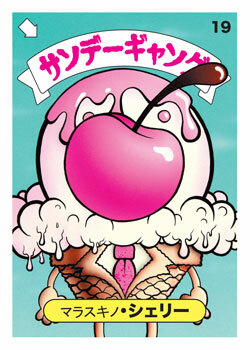 Also, for the Heladitos release he created a sticker album similar to those that were offered with foreign releases. Poster #16 from the original Topps Posters release was titled "How to be a Garbage Pail Kid"…and it featured a 'kid' being overdone with a number of different GPK-gags. 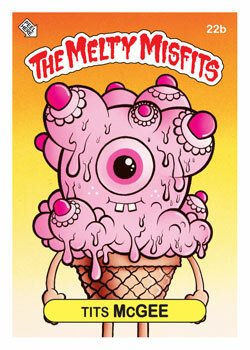 Buff Monster illustrated his own take on this poster and sold 18" x 24" prints via his online store. 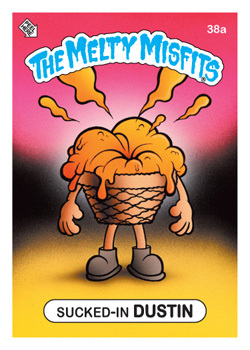 Similar to the Original Series Garbage Pail Kids releases, MM Series 1 included a point-of-sale poster in the top of the counter display box. 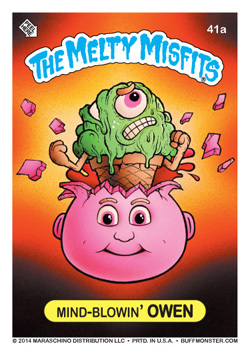 The poster is folded into quarters (just like the original GPK posters).